Dollhouse Paper Miniatures. The Imaginative Content of any Doll House. 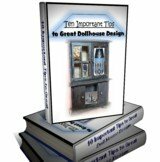 Dollhouse Paper Miniatures - This category includes items such as: books, magazines, art posters, photos, current and antique novels, greeting cards, newspapers, calendars, various items of furniture, crafts, toys, money, passports, holiday items, and the list we are sure could be close to infinite. It's only limit would be your imagination. We find dollhouse paper miniatures intriguing with their oh so tiny details. What do you have around you at this very moment? Do any of those things inspire you to shrink them? Not literally, like the movie "Honey I Shrunk the Kids" or something. But just to attempt to shrink them by scanning, photo, or making a model. Now to us an actual three-dimensional model-type such as: computer, toaster or whatever, does entail an extreme bit of calculating. So this, because of time restraints, is somewhat out. We can however see shrinking our checkbook, passport or some other document though. Without too much trouble where that kind of project is concerned. We have long admired the site where "Jim's Doll's House Pages full of Dollhouse Paper Miniatures" reside. We found them early on in our own quest to online life. Jim has the most amazing printable minis. What fun to sit and create those tiny items for our doll's house. The Turn Around... These Pluses are on Your Side. ....But, on second thought, considering the creation of letter material minis, and the thought of Jim's site.... and our earlier mentioned items of computers, etc., we realize that Jim has done all the work for us! He already possesses those items in calculated measure for a wide array of doll house sizes. Awesome. And because of that, we realize it would take us no time in creating whatever we wanted. Awesome again. Just the thought of creating items in this size, just gets our creative juices flowing. We would love to start right now. The beauty of owning a Doll's House site ourselves is: that we can do any project in miniature we set our minds to on any given day. 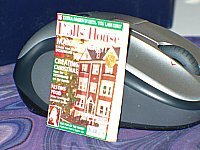 Making a replica of none other than The Doll's House Magazine, December 09 Edition, in our most favorite scale. Barbie Scale. Play Scale. The first step is to scan each side of your magazine. Front and Back. Next use Jim's calculator found here to estimate the size of your finished dollhouse paper miniatures project. Special Note about scale: 100 pixels= 1 inch. We found this useful. As well check this page from Jim's site about scale. Next shrink both of your scans to approximately 200 pixels in height. We left the check-mark beside "keep aspect ratio" and let our program figure out the width. Make sure you crop and fine tune your minis in a photo editor. PLUS make sure each picture is exactly the same in size. Even if you have to uncheck "keep aspect ratio" for one, it will not make any difference. But for the very first photo do use "keep aspect ratio". Let that one set the pace. Now enter your pictures into your FrontPage program, or the like, side by side. No spaces. View it as if on a web page and print. Print 2 out. One on semi-gloss. One on plain letter size. 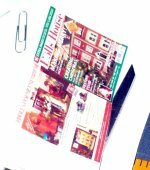 The one on plain letter size is a pattern for cutting out a couple (2) pages for your magazine. The one on semi-gloss will become the cover of your mag. 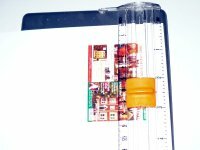 Cut out your tiny magazine. Using your plain letter copy, cut out more pages. We made 4. 2 pages, each folded, making your total of 4. Next we folded our cover and glued the blank pages in place. 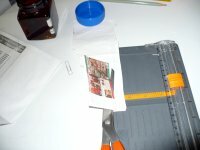 Now that you see how a magazine is made, you have the information needed to do additional projects of similar nature. Hope to see what you've all made in the future.